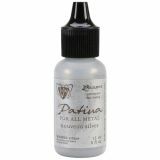 Vintaj Patinas - Open Stock .5oz Bottles - RANGER-Vintage Patinas. This opaque ink is formulated to adhere to metal. It creates beautiful and durable patina effects. This package contains one .5 oz bottle of ink. Available in a variety of colors, each sold separately. Conforms to ASTM D 4236. Imported.